Virginia Gentleman: What got you interested in politics? Mayor Sessoms: My love for Virginia Beach, the city I’ve lived in my entire life, spurred me to become involved in politics. Virginia Gentleman: My first political memory was the 1980 presidential election. I remember on election night hearing my Dad say to my Mom, “It’s going to be a landslide.” It was the first time I’d ever heard the word landslide. Do you have a first political memory? Mayor Sessoms: My first complete political memory came during my run for City Council in 1988. All that hard work paid off; it was a great evening. Virginia Gentleman: Do you think Virginia Beach has a rival city, such as Ocean City or Myrtle Beach? In other words; a city that you are in close competition with? Mayor Sessoms: We compete with cities that want the tourism and convention dollars, but we also have a diverse revenue stream in Virginia Beach that allows us to focus on what’s best for our City, and not for other tourism destinations. Virginia Gentleman: I am here in Fairfax County and the politics in Virginia Beach may be different in some ways, but it seems that the biggest issue facing both our regions is transportation. What are some of the steps you as Mayor are taking to eliminate traffic congestion? Mayor Sessoms: A big coup recently was sitting down with other Hampton Roads cities and prioritizing the transportation projects that are important to the region. For the first time in history we’re working as a team, trying to ease congestion and traffic woes across the area, not just city by city. Virginia Gentleman: In terms of boosting the economy of Virginia Beach, I understand that the City of Virginia Beach has been approached by Comcast-Spectacor, its subsidiary Global Spectrum and Live Nation to build an 18,000-seat arena across from the Virginia Beach Convention Center on 19th Street. What could this mean for the city? Mayor Sessoms: This would be a game-changer. I truly believe Hampton Roads and Virginia Beach need a professional sports team. I’m honored that Comcast-Spectacor has reached out to us. I’d like to see us work out a deal that benefits both of us. Virginia Gentleman: You have mentioned the need for Mass transit. Here in Northern Virginia we have the Metro system. I understand there is a referendum on Light Rail in Virginia Beach in November. What would this referendum do? Mayor Sessoms: If the referendum on Light Rail is approved in November, it does not mean Light Rail will come to Virginia Beach. A “yes” vote allows for public input on Light Rail and further analysis to see if public funds are available to build the transit system within our City. Virginia Gentleman: I know the issue of education is important to you. And recently I learned that Eight Virginia Beach High Schools made Newsweek magazine’s list of “America’s Best High Schools” and a comprehensive study of 17,377 school districts by GreatSchools.com ranked Virginia Beach fifth overall, or in the top 1% nationally! What is Virginia Beach's secret to achieving those types of results? Mayor Sessoms: We believe in supporting and funding education even in tough economic times; it can’t be said enough, the children are our future. Virginia Gentleman: For those of us in other parts of the state how would you describe Virginia Beach politically? Does it lean more to the Democrats or Republicans? 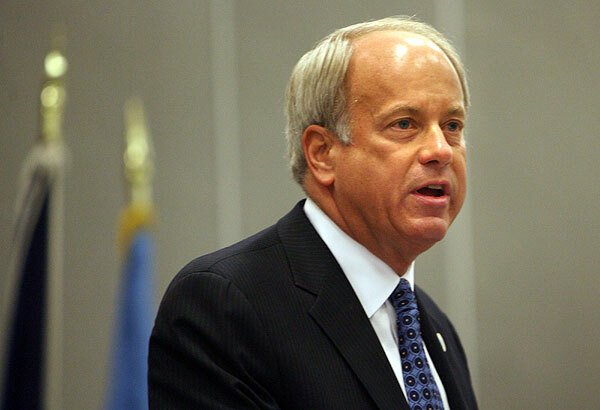 Mayor Sessoms: Virginia Beach leans Republican, but we also have a lot of Independent voters.